The Hannah James Trio invites you to join them as they embark on a journey of sonic intrigue and musical storytelling. Featuring soaring melodies, explorative solos, shape-shifting rhythms, cinematic textures and musical twists as told by bassist Hannah James, Casey Golden (piano) and Edward Rodrigues (drums). They invite you to join them for the launch of their latest album Triliphony, which was recorded live earlier this year at the Sound Lounge and was supported by SIMA and APRA. 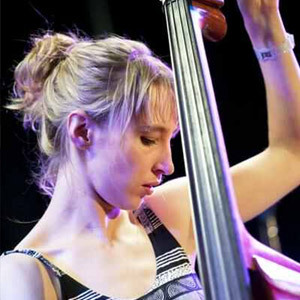 Hannah James was the 2011 recipient of the Jann Rutherford Award for women in jazz. Since the formation of her group in 2011 she has performed extensively throughout Australia including the Wangarratta Jazz Festival, the Capitol Jazz Project, Sydney Women’s’ International Jazz Festival, the Jazz Groove Summer Festivals, Brisbane Powerhouse and Bennett’s Lane, releasing her debut album ‘Effigy’ in 2012. Now carving a firm place in the Australian music scene, Hannah is a sought after musician who has performed with artists such as Katie Noonan, Sandy Evans, Alister Spence, Don Burrows, Bob Barnard, Dale Barlow, and Miroslav Bukovsky.